Diminutive Irish-American character actor Walter Burke could be quite sinister looking with his stone-carved face and piercing, beady eyes, but in other roles he could be a jovial leprechaunish type. Born Walter Lawrence Burke August 25, 1908, in Brooklyn, NY, to Irish immigrant parents Thomas Burke, a laborer, and Bedelia McNamara Burke, he had one brother and two sisters. With a distinctive face and voice he gravitated to acting, making his Broadway debut at barely 17 as part of the ensemble in the musical comedy “Dearest Enemy” which ran from Sept. 18, 1925 to May 22, 1926. Another brief run in “Padlocks of ‘27” occurred before he joined the American Opera Company’s troupe in January 1928, performing a non-singing role in “Faust”. He continued with the company through January 1930, before returning to Broadway where 10 other Broadway productions kept him busy until he came to Hollywood for a small role in “The Naked City” in ‘48. But it was Burke’s weaselly cigarette-dangling-from-his-lips characterization of political flunky Sugar Boy in the Oscar-winning “All the King’s Men” (‘49) that set the tone for many of his later roles. Through the years he returned to Broadway and appeared in some 25 movies, including “How the West Was Won” (‘62), “My Fair Lady” (‘64) and both “Support Your Local Sheriff” (‘69) and “Support Your Local Gunfighter” (‘71), but both took a backseat to his well over 200 television roles. 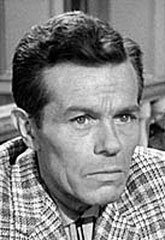 Never quite a regular, he did appear five times as liveryman Tim Potter on “Black Saddle” (‘59-‘60) with Peter Breck. He was one of several actors who subbed for prosecutor William Talman during the ‘60-‘61 season of “Perry Mason” and, in a memorable but unbilled assignment, Burke convincingly voice-doubled for narrator Walter Winchell in a handful of early ‘60s episodes of “The Untouchables”. 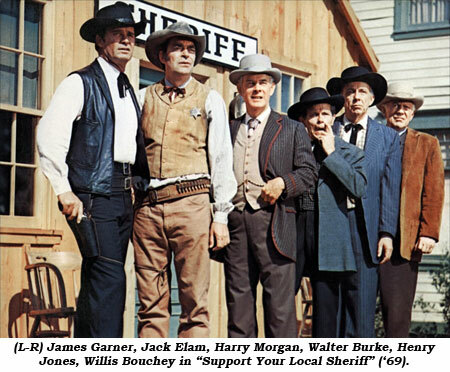 Burke had a shot at becoming a regular as Dale Robertson’s very Irish aide Michael Francis O’Connor on “Diamond Jim” in ‘66, unfortunately the ABC color pilot did not sell. Throughout his voluminous TV career Burke had no objection to accepting lesser but memorable roles, but some of his meatiest included “Tales of Wells Fargo: The Little Man” as a banty-rooster stage bandit with a short-man complex; “Two Faces West: The Drought” as a well-spoken rainmaker con man; “Lawman: Samson the Great” as a downtrodden prizefight promoter; “Branded: A Taste of Poison” as a devious old prospector; “Laredo: A Question of Guilt” as a bitter Indian hater; “Wild Wild West: Night of the Cut-Throats” as a corrupt town mayor; and “Guns of Will Sonnet: The Trap” as the boss of an illegal work camp. Other westerns included “Yancy Derringer”, “Sugarfoot”, “Zane Grey Theatre”, “Law of the Plainsman”, “Rawhide”, “Man From Blackhawk”, “The Alaskans”, “Klondike”, “Have Gun Will Travel”, “Outlaws”, “Wide Country”, “Empire”, “Temple Houston”, “Legend of Jesse James”, “Death Valley Days”, “Big Valley”, “Daniel Boone”, “Gunsmoke”, “Virginian”, “Nichols”, “Bonanza” and “Grizzly Adams”.